Gersson Rosas, shown here in 2013 when he was witih the Mavericks, will have a second interview with the Sixers. The 76ers are in the midst of a second round of interviews for their vacant general-manager position. 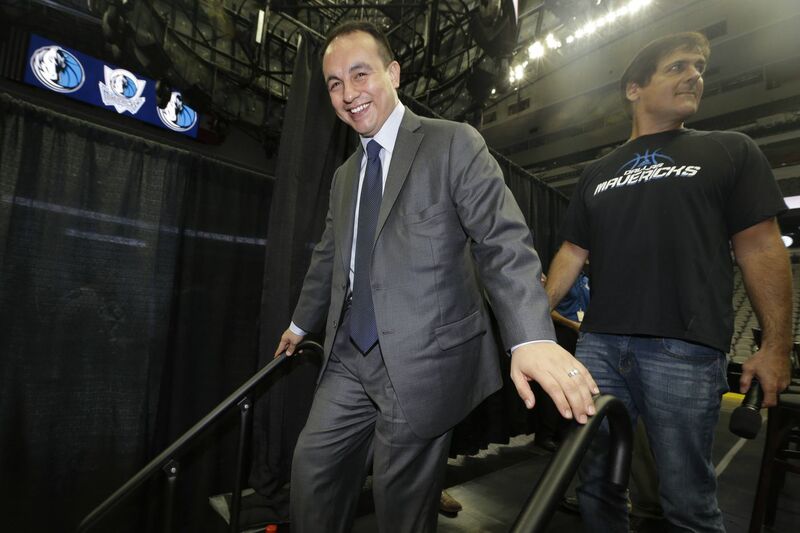 The ownership group had a dinner interview Sunday with Utah Jazz assistant general manager Justin Zanik and had another one with Houston Rockets vice president Gersson Rosas Monday, according to multiple sources. The sources add that the Sixers will have second interviews with their internal candidates later this week, expected Thursday and Friday. The GM position has been open since Bryan Colangelo resigned in June. The team first interviewed internal candidates Elton Brand, Marc Eversley, Ned Cohen and Alex Rucker, last week. Meanwhile, Zanik and Rosas, along with Larry Harris, Golden State's assistant general manager and director of player personnel, interviewed for the GM position two weeks ago. Harris will not get a second interview. Coach Brett Brown has served as interim head of basketball operations during the search for Colangelo's replacement. They have been open about hiring a general manager willing to work in a collaborative decision-making setting instead of having the final say. Sources have said that the Sixers want their next GM to be someone who will be a public face and win over the fans. Brand is the Sixers' vice president of basketball operations and general manager of their G-League team, the Delaware Blue Coats. He also had two playing stints with the Sixers. He most recently signed with the team in January 2016 to be a mentor to the young players. Brand retired from playing in October 2016, ending a 17-year career that started when the Chicago Bulls chose him with the first pick in the 1999 draft. The 6-foot-8, 265-pounder's previous stop before rejoining the Sixers was with the Atlanta Hawks for two seasons. Brand previously played four seasons for the Sixers before he was waived on July 12, 2012. Cohen is the Sixers' assistant general manager. Eversley is the senior vice president of player personnel, and Rucker is the senior vice president of analytics and strategy. Denver Nuggets general manager Arturas Karnisovas backed out of a scheduled interview two weeks ago. Meanwhile, the Sixers interviewed former Cleveland Cavaliers GM David Griffin earlier this summer, but felt like he wasn't a good fit.